Located about 120 miles east of Dnipropetrovsk, Donetsk is the fifth largest city in Ukraine (following Kyiv, Kharkiv, Odesa, and Dnipropetrovsk) with an estimated 2010 population of 982,000. It was established in 1869 and originally named Yuzovka (Юзовка), an approximate transliteration of the surname of John Hughes, a Welshman who developed several coal mines and built a steel plant in the area. Coal, iron, and other minerals have defined the city, providing it with the resources for a heavy industrial base, including ferrous and non-ferrous metallurgy, coke-based chemicals, mining equipment, and machine-building. The city also is home to lighter industry, such as food processing. Donetsk is the administrative center of Donetsk oblast and one of the key cities of eastern Ukraine. Although it does not rival Kharkiv as an academic center, it is nonetheless the location of several very strong academic institutions. It is a major transportation hub and also is well known for its sports teams, especially in football. The Donetsk population is almost evenly divided between Ukrainians and Russians; close to the Russian border, it is highly russified and, in common with Dnipropetrovsk, its citizens are significantly involved in Ukrainian national politics. Estimates of its Jewish population range from 6,000 to 20,000. 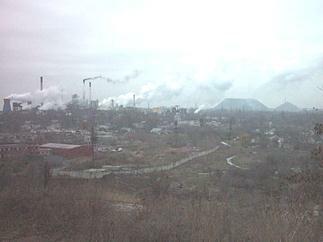 Over 40 coal pits are located within Donetsk city limits. Seen at left are mining tips and industrial areas, along with accompanying pollution. The Kalmius River, which runs through the city, formed part of the tsarist-era border between the Pale of Settlement in which Jews were permitted to live and the rest of European Russia, which was generally closed to the Jewish population. Photo: http://www.mapofukraine.net/donetsk/donetsk_ukraine.html. Retrieved July 18, 2011. 44. Or Menachem, also known as Donetsk School #99, is housed in a large former general public school building located in a remote area of the city. Established 15 years ago by Chabad, its current enrollment in grades one through eleven is 153, a significant decline from an enrollment of 256 when the writer last visited the school in 2005. All but two or three pupils are halachically Jewish, said school officials. According to Principal Zinaida Skamrodina, Or Menachem enjoys a good reputation in the city and its pupils do very well on state examinations. Graduates of Or Menachem, said Ms. Skamrodina, attend universities and colleges in Donetsk and Odesa, and some girls attend Beit Chana in Dnipropetrovsk. Included in the regular enrollment figures are 14 girls in a religious machon and 14 boys in a yeshiva katana. Almost all of the youngsters in the more intensive religious programs are children of rabbis. Five Israeli teachers, one of whom is supported by the Israeli Heftzibah program, are responsible for the Jewish studies program at Or Menachem. At minimum, said Ms. Skamrodina, pupils in the regular curriculum have five class periods in Jewish studies each week, including lessons in Hebrew language, Jewish tradition, and Jewish history. In response to a comment by the writer regarding the advanced computer technology courses that she remembered from her previous visits to the school, the writer was shown the current computer facility, which little resembles its previous sophistication. Somehow, an earlier relationship with ORT had been severed and the school lacked resources to replicate ORT equipment and the ORT curriculum. Or Menachem retains 14 computers, most of which are 12 years old. Only six of the computers are operational, said an instructor. The obsolescence of the computers and related equipment means that the level of computer technology taught at the school is very low. The computer technology instructor and Ms. Skamrodina estimated that 85 percent of school families have computers at home and that all such families are on the Internet. Or Menachem uses e-mail and the Internet for some communications with pupil families, they said. Two or three students share use of a single obsolescent computer at Or Menachem in Donetsk due to a lack of modern technology. Very few parents assist the school financially, said Ms. Skamrodina in response to a question. However, she noted, some with applicable skills help to repair damage to the facility. The largest outside source of financial assistance, she continued, is the Avi Chai foundation, which provides funding for two annual Shabbatons. Avi Chai used to support certain extra-curricular activities at Or Menachem, Ms. Skamrodina said, but this type of assistance is much lower than it used to be. Notwithstanding the loss of Avi Chai funding for enrichment activities, the school retains much of its traditional strength in the arts. 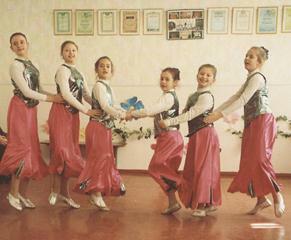 The writer viewed presentations by a girls’ dance group and a coeducational drama group. A girls’ dance group with Israeli-style choreo-graphy and a coeducational drama group, which appeared to draw on Jewish folklore for its vignettes, performed for the writer in a school dance studio. The Or Menachem curriculum has been enriched by a strong arts program since the school’s inception. 45. A Chabad preschool is located on the ground floor of an apartment building. Its premises include two classrooms and several smaller rooms, as well as an adjoining playground with a small assortment of playground equipment. Legally, said the preschool management, the playground belongs to the preschool, but it is broadly used by neighborhood families as well – without permission from the preschool.